This guidebook includes detailed chapters on: the history of New Orleans, the French Quarter and the greater city, and the bayous and coastal area. A chapter on voodoo includes guidelines for integrating it into Call of Cthulhu. New occupations unique to the Crescent City and the area are suggested, and five secret societies are covered. 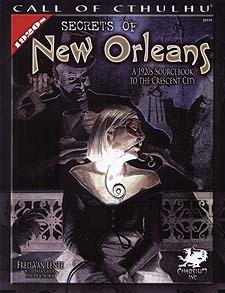 A scenario designed to acquaint investigators with most of New Orleans' areas completes the book.